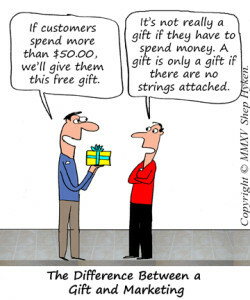 Gift with Purchase: True Customer Perk or Marketing Ploy? Have you ever been given a gift of appreciation from the place that you do business with? The other night I ate at a restaurant. Once we sat down, the server brought over champagne glasses for each of us. The server told us that they love to start every guest experience with a complimentary glass of champagne to toast the customer. This little perk was an unexpected, but greatly appreciated, gesture. Most of the time the only thing the server gives us at a restaurant is the menu. Not that there’s anything wrong with that. It’s just this restaurant bumped the guest experience up a notch and set the tone for the rest of the evening, which, by the way, was exceptional. And, at the end of the meal, they brought over a platter of wonderful chocolates, again, complimentary. A great way to end our experience. What this restaurant did was no different than any other business that practices what is known in the retail industry as a gift with purchase. The concept is to reward the customer for their business. This isn’t a loyalty program, but a perk. And, it applies to every type of business – both B-2-C and B-2-B. Some companies give different gifts based on the amount of money spent. For example, on occasion my wife will come home with some cosmetics. Because she spent a certain amount of money, they gave her a “gift,” which was several small bottles of their other products. Now, is this truly a gift or perk, or is this a marketing ploy? I recently bought something through a website that offered free shipping on any order of $20 or more. Everything they sold was $9.95. I usually order two tubes of their product, which means I’m ten cents short of qualifying for free shipping. Is this their “gift” or perk for spending $20, or is their scheme to get me to buy a third tube of their product? Why don’t they just tell me to buy three and I get free shipping? I’ve written something similar to this before about loyalty programs. When is a loyalty program not a loyalty program? When it’s really a marketing program. And, the concept of the gift with purchase can quickly fall into that category. By the way, it doesn’t bother me that it’s a marketing program, just don’t tell me I get a free gift when I spend enough. Call it an incentive or some other similar term, but don’t tell me it’s a gift. The restaurant example is perfect. They know I’m probably going to order dinner, but they don’t really know how much I’ll spend. And, regardless of how much I spend, I’m still getting the gifts. They do it for every customer. It’s part of the experience they create for every guest. Yes, I know I’m paying for it in some other fashion, but it’s a nice gift on behalf of the restaurant. Done well, the concept of a gift with purchase works. Make it a perk – a true gift – and not an outright marketing scheme, and you’ll reap the rewards of happier customers, return customers and great word-of-mouth marketing. This article was syndicated from Business 2 Community: Gift with Purchase: True Customer Perk or Marketing Ploy?